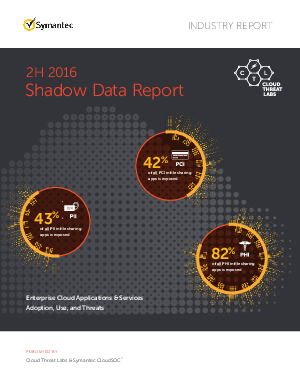 The Shadow Data Report, published by Symantec, addresses key trends and challenges faced by enterprises securing data in cloud apps and services. This report is focused on the potential risks enterprises may encounter whenever they adopt insecure or non-compliant apps, implement insufficient policies around data governance, allow the accidental sharing of files, or become exposed to malicious insiders and hackers. In addition, this report covers the potential repercussions of data leakage, including compliance and mitigation costs.